Oaks at Wildwood is a 55+ active adult community in the heart of the Georgetown area. It started in 2007 and has now blossomed into an active community complete with 86 affordable attached homes. This Epcon community stays true to their name with high standards, quality workmanship and a hassle-free living experience. Residents of the community get to enjoy the beautifully designed clubhouse that features suitable amenities to maintain personal well-being. The numerous social clubs and activities provide a friendly, lively environment. Oaks at Wildwood offers the best of both worlds, a private tranquil setting yet conveniently located in Georgetown near ample shops and attractions. The cozy clubhouse is a great place to gather with friends and enjoy the big screen TV, a game of billiards or baking in the fully-equipped kitchen. Residents can also take advantage of the computer and media room. The 24-hour fitness center provides convenience and is equipped with cardiovascular and resistance training equipment. Weekly yoga and dance classes allow you to stay active and in shape. The outdoor pool is a great escape for residents to relax and soak up the sun. The amenities provide a suitable and pleasing way to make wellness and fitness part of your balanced lifestyle. This active adult community is comprised of 86 low-maintenance attached homes. Epcon Communities offered two models arranged in groups of four that range in size from 1,718 to 1,884 square feet. The homes feature two to three bedrooms, two bathrooms and a two-car garage. These homes are designed to have open living space with private entrances, generous storage, and a four-seasons room. Residents pay a reasonable homeowners' association fee that allows maintenance-free, carefree living. Lawn care and exterior building maintenance are taken care of by the association. These homes were designed for the active adult interested in a maintenance-free lifestyle. The various amenities offered at the community contribute to an easygoing, active adult lifestyle. With the welcoming environment, residents make life-long friends and are able to enjoy the simpler things in life. Residents never get bored with numerous social clubs and activities that are offered including bridge club, book club, casino night, wine and cheese, dance classes and much more. This active adult community is located in the heart of Georgetown on Wildwood Drive near I-35. Georgetown was also voted the number two place to retire in America by Money Magazine. It is conveniently located next to shopping, restaurants, and recreational activities. Nearby residents can enjoy the Palace Theatre, Georgetown Symphony Society and Southwestern University. The attractions of Georgetown are endless. Residents can explore in the Inner Space Cavern, San Gabriel River, or enjoy bowling at Mel s Lone Star Lanes. The Georgetown Antique Mall and Rough and Ready Antiques are great places to find fascinating treasures. Oaks at Wildwood is also close to major highways and the airport making travel a breeze. Active adults are flocking to this Central Texas community from across the country. There are plenty of activities available in Oaks at Wildwood. Here is a sample of some of the clubs, activities and classes offered here. 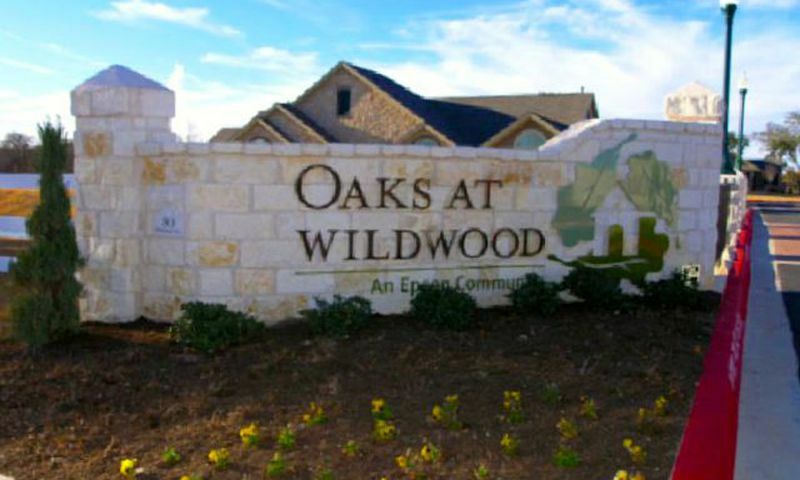 Oaks at Wildwood is comprised of 86 maintenance-free attached homes. Epcon Communities offered two models arranged in groups of four that range in size from 1,718 to 1,884 square feet. These homes feature two to three bedrooms, two bathrooms and a two-car garage. These homes are designed to have open living space with private entrances, generous storage, and a four-seasons room. I just moved in to a condo here and so far so good. I can walk over to the clubhouse but most important, I wanted to stay in the Georgetown area. I've lived in the area for years and really like all the great shopping and restaurants. We've got everything here. Plus my 3 grandkids all live nearby and I just love being so close to them! 55places.com is not affiliated with the developer(s) or homeowners association of Oaks at Wildwood. The information you submit is distributed to a 55places.com Partner Agent, who is a licensed real estate agent. The information regarding Oaks at Wildwood has not been verified or approved by the developer or homeowners association. Please verify all information prior to purchasing. 55places.com is not responsible for any errors regarding the information displayed on this website.